Standing desks are quickly gaining popularity because they address many of the health concerns brought on by the modern computer desk lifestyle. This article is about the bucket built standing desk which I’ve designed that anyone can built quickly and try out. You burn a lot more calories standing than sitting. Multiply those tiny benefits over a 8 hour day and a 300+ day year, and one tiny change in how you work can help make a huge shift in health. And weight loss is just one of many benefits to a standing desk. Research shows that it improves mental focus while you work and helps to keep your muscles and bones healthy. 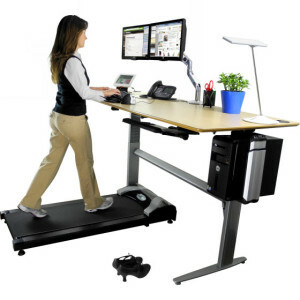 Some people take standing desks even further and walk slowly on a treadmill so they can stroll in place while they answer emails. Office desks can be one-size-fits-all, because instead of adjusting the desk height, you just adjust your wheeled chair with a little lever on the bottom. But with a standing desk you have no such chair-your legs are always the same length no matter what you do to them. 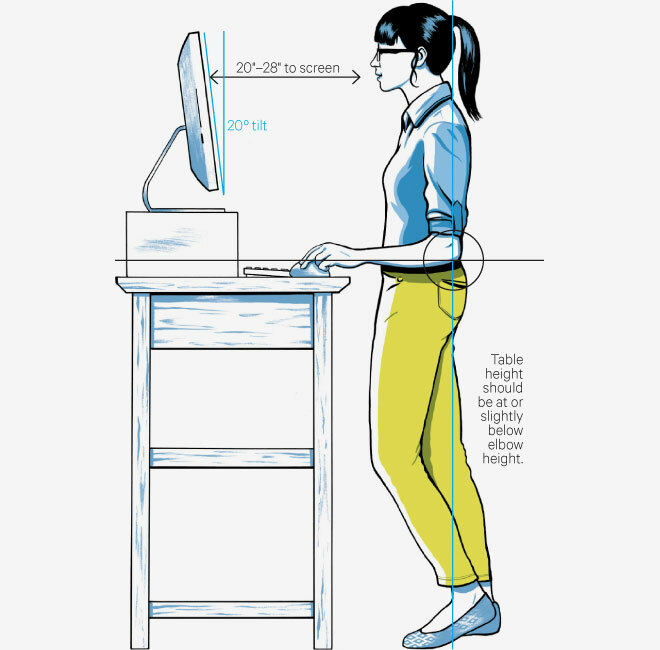 That’s why standing desks need to be custom heightened to their user. 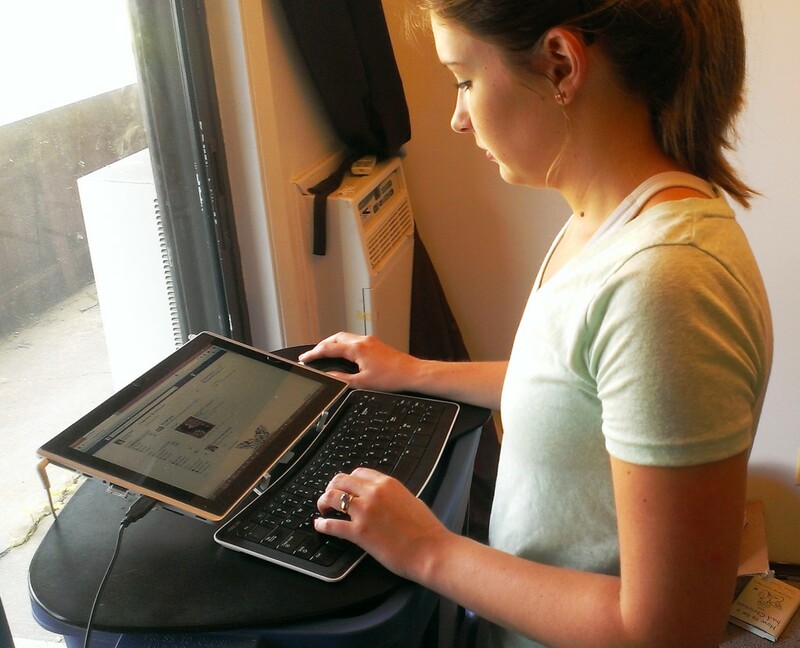 The surface of a standing desk should be at elbow height to maximize typing comfort. The custom nature of a standing desk and relative rarity make them more expensive than typical desks. That’s why so many people use use standing desks they’ve hacked together themselves, built or tied together from various pieces of pre-existing furniture. I started this blog on my old standing desk – an ugly marriage of a dresser and a shelving unit on top. My brother made his first standing desk out of a dining table propping up a coffee table. I think my most recent standing desk is a good enough design to be shared. It’s smaller and more portable than any other design I have come across, and uses cheap, strong, and readily available materials. This surface is the same laptop computer desk surface from the coffee table article. It’s much more usable than the bare Rubbermaid lid surface and makes a perfect mouse pad. I used to have a standing desk in the dining area – but the floor there is hard, and makes standing for more than about half an hour uncomfortable. 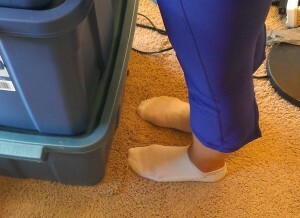 Having the desk on carpet makes standing for longer much easier. A bucket desk is mobile. Right now I have mine directly in front of the best spot in our apartment – by the large sliding glass doors where plenty of natural light comes in. This desk holds huge loads of items too – I’ve got half my wardrobe in the bottom one, then a garbage bin, then cardboard recycling. Wasting bucket space doesn’t happen – not in my house. Mounting a full sized monitor on this desk would make it impossibly top heavy. Instead I’m using a tablet computer at an almost flat angle. 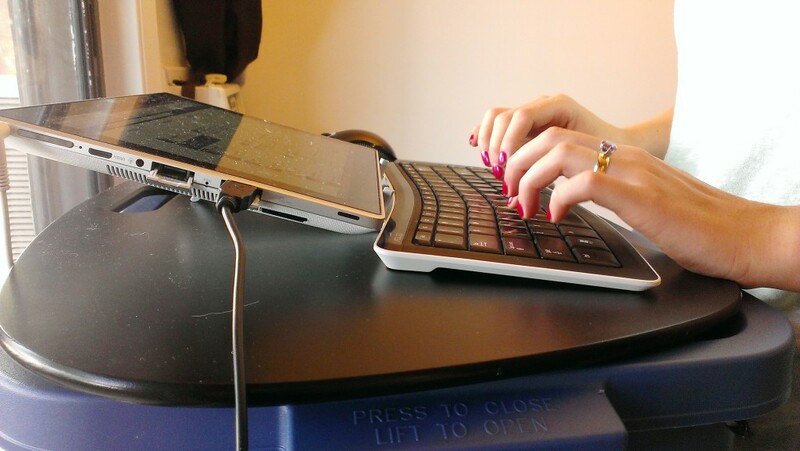 My EP121 tablet is as large and as powerful as many laptops, and comes with a separate keyboard. The mouse is Bluetooth to cut down on cords. 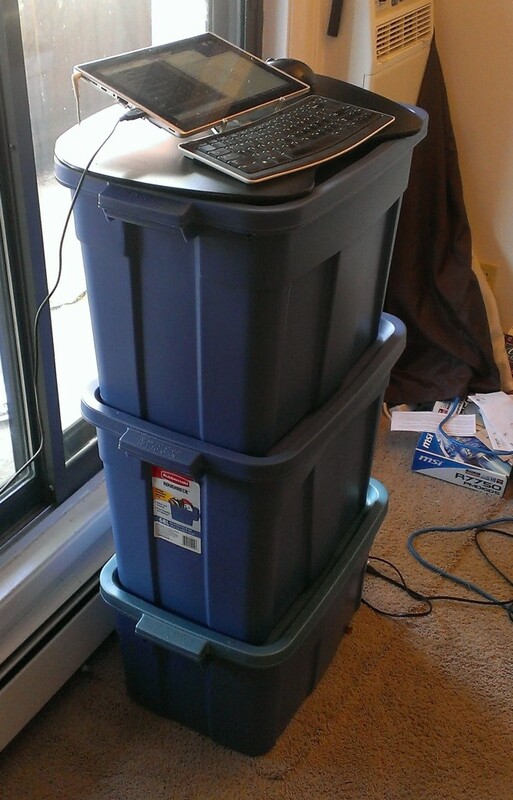 A laptop might be compatible with the bucket standing desk depending on how oblique of an angle it can be opened to. If you’re set on a standard computer monitor, one could quite easily be mounted on a nearby wall at eye level and the desk surface could be for used typing and mouse movement only. Is the bottom tub the 18-gallon size like the top tubs? Hard to see from the photo angle. This is interesting, I could attach my flat monitor and lamp to the wall, and use the tubs to hold all my computer supplies and rarely- used electronic equipment. It isn’t! I believe the bottom is a 10-gallon. The sizes you use will depend on your height. We are 6′-2 and 5′-9 so a bit taller than average.